El Blog de Medicina Cubana: Exchange visits to hospitals and Children's Hospital Boston and the University of Texas Health Sciences, Cuban doctors. Exchange visits to hospitals and Children's Hospital Boston and the University of Texas Health Sciences, Cuban doctors. 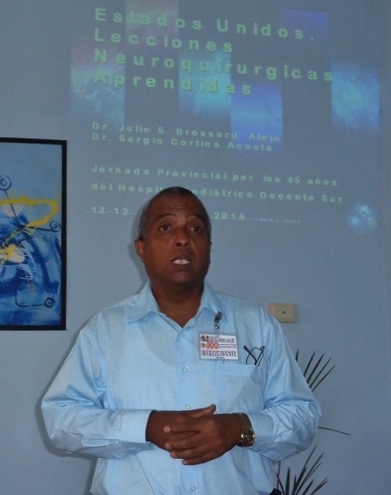 Work experience for more than five years with health professionals in the United States underpinning the Dr. Julio S. Brossard Alejo, chief of neurosurgery at Children's southern province of Santiago de Cuba hospital, to endorse the possibilities that could be opened for cooperation in this field between Cuban and American institutions. Repeated exchange visits to hospitals and Children's Hospital Boston and the University of Texas Health Sciences, among others, have allowed the Santiago doctor prestigious meet the academic, scientific and educational potential of their US counterparts, and show significant results achieved by the pediatric neurosurgery at the greater Antilles, even though more than 50 years of US blockade to Cuba brake turn to this medical field. The Master in Science Brossard Alejo, also a senior lecturer in neurosurgery at the hospital institution, recognized the solidarity contribution of American colleagues and the growing interest shown by meet and exchange with professionals from Cuba. “Counterparts in various medical institutions in the United States always manifested in favor of active cooperation in the field of neurosurgery have, says the doctor, and gesture of solidarity has provided literature and other materials currently used in the care of children and girls admitted to our service. Publicado por EG en 6/13/2015 08:39:00 p. m.